When I am reading other blogs I am always curious about what the blogger is working with, especially when it come to sewing machines; so I thought I would play “show and tell” with my tools. Bernina 550QE: I Have owned this machine for almost two years now and I have been very happy with her (yes this machine is a girl) I bought this machine as an upgrade to my old Janome CS995 as I was struggling to achieve the results I wanted on this machine. Bright LED lights and lots of them. 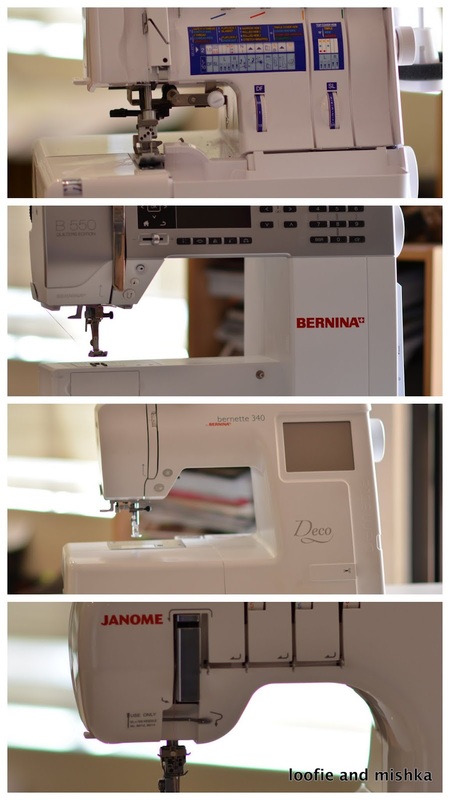 Elna 845 Overlocker (serger): I bought this machine two years ago and I have been so impressed with it as an overlocker. The thread cutter is too blunt. Janome Coverpro 1000CPX(coverstitch machine): This machine is a bit of a luxury; I bought it last year after cursing the coverstitch function on my Elna. I love that this machine “just works” it makes it so easy to hem all my knit items- the machine gives you that great double row of stitching you see on ready to wear garments. Bernette Deco 340 (Embroidery Machine): This is an embroidery only machine and I am really happy with it. I fell in love with Machine embroidery because it is so easy to make an otherwise boring item both personalised and fun. If you are new to sewing and are looking for a machine rather than recommend any one brand I would only suggest buying the best machine you can afford and that may mean buying second hand. Buy a machine that is slightly more advanced than your needs so that you can "grow into it"
Although it is possible to have only two machines and still have the same capabilities, I find it is less time consuming to have separate machine set up and ready to go- for example my overlocker can perform the same function as my Coverpro, but I would have to convert and re-thread each time I hemmed a garment. I Think the only change I may make to this line up in the coming years is to leap into the big bad world of multi-needle embroidery machines, but this is a big investment and will have to wait for now. In my next post I will be talking about my favourite sewing notions and other fun gadgets; hope to see you then.